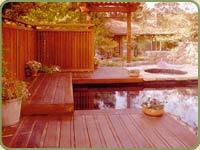 - Pergolas: are shaded walkways with pillars that support cross open beams and a lattice for providing shade. - Trellis: are wooden stuctures that provide support for climbing plants such as grapes, vins and roses. For technical information on California Redwood see this page, or the Redwood species page for more general info.